The MF1 is basically a smaller version of the MF2 and has all the characteristics of the larger version including the glass breaker on the end and the bridge clip. It has a more conventional handle than the MF2. Makes a great EDC. 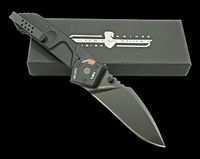 The Extrema Ratio MF1 blade is a very strong drop point. This drop point terminates in almost a spear point. Duel thumb stubs. Hand sharpened and sharp out-of-the box. Ergonomically designed to give you an excellent grip. Also has a hardened window breaker. Reversible side to side clip with a tip up carry. This clip is a bridge clip that wraps around the end of the MF1 to allow only the clip to show to give you a concealed knife carry. The MF1 actually has two locks. A liner lock combined with a manually activated locking mechanism that should be used for additional secure locking.